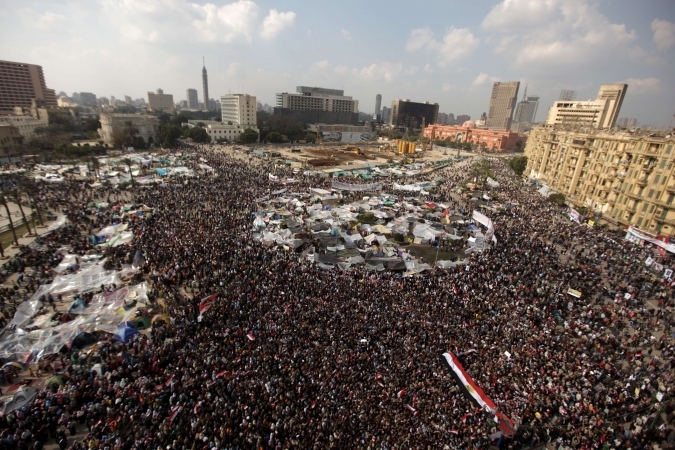 Until today the earthshaking Egyptian revolution appeared to be losing momentum. Regime propaganda, repeated on state TV and in Saudi-owned regional media, appeared to be convincing significant sections of the population that the protests were responsible for diminished security (although it was the regime that freed violent criminals and pulled police off the streets) and economic destabilisation (although it was the regime again which closed the internet, halted the trains, and dealt perhaps a long-term blow to tourism by encouraging mobs to attack foreigners). As 40% of Egyptians rely on daily wages for survival, success of regime propaganda in this area could fatally undermine the revolution. The United States clearly believed that Mubarak, Suleiman and the military, having weathered the initial shock, were slowly but surely regaining control. After meeting the ruling clique, Obama’s envoy and Mubarak-business partner Frank Wisner praised Mubarak and insisted that he “must stay in office to steer” a process of achieving “national consensus around the preconditions” for the future. The White House said Wisner was speaking in a personal capacity, but didn’t contradict him. Hillary Clinton, meanwhile, expressed support for Vice President Omar Suleiman’s transitional leadership. Suleiman’s credentials for midwifing democracy include personal supervision of execution by torture, a rock solid reputation with Israeli intelligence, and his oft-stated belief that Egyptians are not yet ready for democracy. Even as the regime and its American sponsor speak of dialogue, reform and transition, arrests of opposition activists and harrassment of journalists continue, as does the decades-old state of emergency. In one hand the stick, and in the other the carrot: state salaries and pensions have been increased by 15%, and the public sector has announced it will employ the unemployed. The regime has had neither the time nor the inclination to reorder the economy to benefit the working class, so it’s most probable that Egyptians are about to benefit from a temporary cash injection from Saudi Arabia and other terrified Gulf states. So on the regime’s side, in concert with the Gulf, Israel, and the US, a policy of bribery, violence, scapegoating, division, conceding to demands that were never made, delaying tactics and avoidance, which seemed to be steadily working. On the revolution’s side, only Maydan Tahreer – which is a great symbol, a liberated space, but not a strategy by itself. The revolution seemed to be losing momentum. But this revolution is deeply rooted and profoundly intelligent, and there are signs that it is ready to enter the next stage – to establish dual sovereignty in Egypt. Youth groups in Maydan Tahreer have formed a unified command. Revolutionary Socialists Egypt have called for the establishment of revolutionary councils in every Egyptian city. Democratic organisation will enable the revolution to coordinate its fire, maximise the impact of its weaponry, and to regain the initiative. Reports that the parliament building has become a new front for protest suggest the initiative is indeed being regained. But it’s the workers whose weaponry is heaviest. The revolution arrives from a background of ballooning industrial action in Egypt, and today there is news of fresh strikes, including at Egypt Telecom and the Suez canal. A few days ago workers detained a union chief on the charge of corruption and abuse of authority. The Vice Dean of Alexandria University removed pictures of Mubarak from an official building citing the inappropriateness of “outdated thoughts.” The Beduin in Sinai have rocketed the state security building in Areesh responsible for policing Gaza, and are probably responsible for the attack on the pipeline transporting cut-price gas to Israel. Egyptians are still fighting back against police oppression, demonstrating and burning police stations. As in Tunisia – where the revolution continues – the people have lost their fear. There’s a revolutionary spirit abroad, and with it a unity not seen since the 1919 anti-British uprising. There hasn’t been a single attack on a church in the last 16 days of ‘lawlessness’. Sectarian attacks occurred frequently when the churches were guarded by Mubarak’s police. This unity, and the newfound civic pride, will introduce a strain into national culture which won’t be extinguished. The revolution must not, and (I believe today) will not, stagnate. It must take more initiatives, announce new locations for protest, engage in more direct action. And the army must be addressed much more directly, the lower and middle ranks encouraged to side decisively with the people for a total change of regime. Romantic assumptions concerning the army are not at all useful. Today’s military is not the same force that fought Israel, Britain and France. It’s an American-funded apparatus for ensuring Israel’s security. It’s the heart of the Mubarak regime. It goes without saying that I’m offering advice from the safety of my screen, thousands of miles away, well behind events. I knew Egypt was bubbling, but I was taken by surprise when the Egyptian people lost their fear en masse. And before that Tunisia took me by surprise. Today the crowds on the streets are larger than ever. Now nothing will surprise me, not even victory. thanks for your commentary Robin. i regularly think about my visit there and the felluca trip where we met. there was a hint of revolution in the air then but still incredible that things have moved so quickly. my thoughts and very best wishes are with the brave people of Egypt.